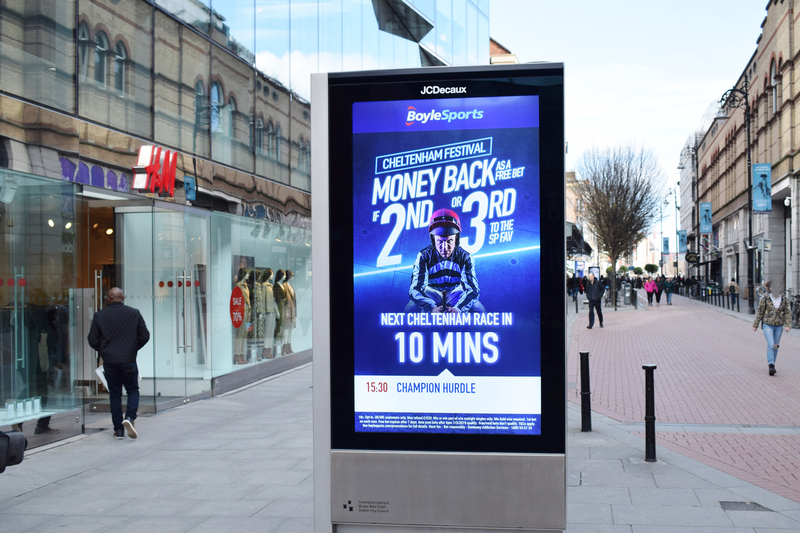 With Cheltenham dominating much of the sporting agenda this week, the Irish bookmaker BoyleSports launched a highly visible Digital OOH (DOOH) campaign to woo punters with it’s ‘money-back’ offers and grow its share of the betting market at one of the busiest times of the year for bookmakers. With 28 races taking place across the 4-day festival, the bookmaker created a strong call to action on the digital displays with triggers counting down in advance of each race and content showcasing the name and time of that race. Alongside the dynamic and classic deliverables, BoyleSports promoted its Cheltenham Money Back offer, with the campaign fronted by its Racing Ambassador 2017 Cheltenham Gold Cup winning jockey Robbie Power. Our Dynamic CMS platform allows brands to deliver contextually relevant advertising at scale and in real time seamlessly across multiple DOOH networks and media owners using a multitude of scheduling and content triggers. Research has shown that OOH using dynamic digital content boosts overall effectiveness by an average 18%. Using in bar panels and urban roadside digital formats in the form of Social Ds, Orbscreen and Digipanels ensures the attention-grabbing adverts hit the right people at the right time with a highly relevant message. 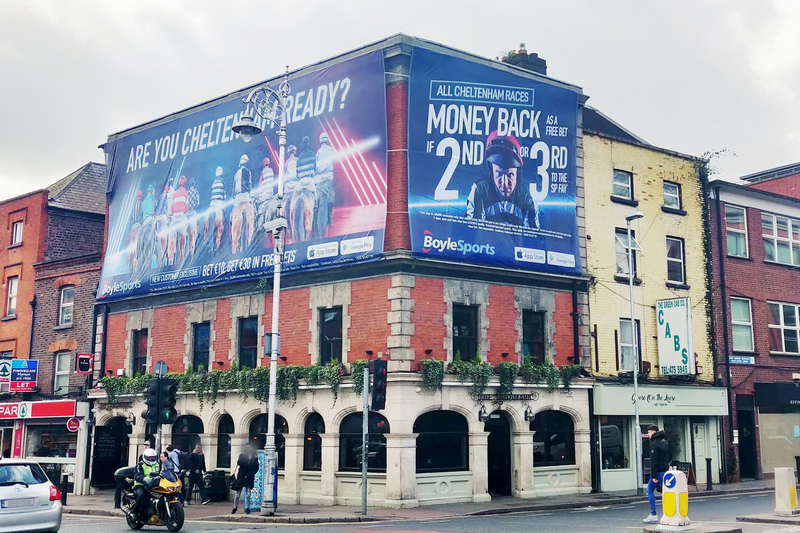 BoyleSports has also taken over the streets of main cities in Ireland with large banners appearing across key locations in Dublin, Cork, Galway and Limerick creating unmissable impact and gaining top of mind awareness for BoyleSports surrounding one of the biggest spectator sports in the world. The campaign was planned by PHD with placement by Source OOH. “BoyleSports have certainly chosen a great way to promote their Cheltenham cash back offers, this form of live messaging has grown into an impactful tool for advertisers and allows BoyleSports to generate buzz around the Cheltenham festival and create in the moment dialogue with its audience,” concludes Fiona McDonnell, Senior Account Manager in Source out of home.